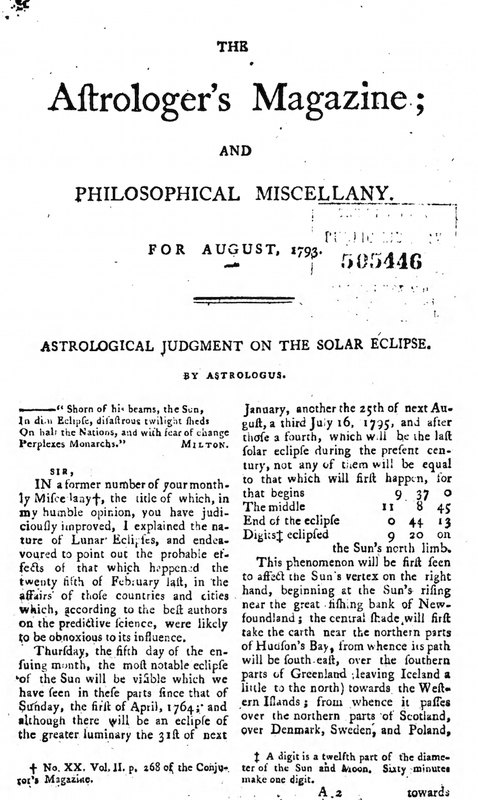 Astrologer's Magazine and Philosophical Miscellany, The. London, England. Publisher: Printed by W. Locke. 3/1, August 1793-1797. 36-48 pp., 4 x 8. 1 s. an issue (a price the journal contrasted with the (L)24 subscribers paid for Lavater’s work that it was publishing serially). Continues numbering of Conjuror's Magazine. Illustrated. The journal included questions and answers on a variety of topics and notes on astrology, Lavater's physiognomy, the power of the devil over human bodies, Swedenborg's nativity, palmistry, prophecies, properties of mercury, "rising Greatness of the American States," animal magnetism, Nostradamus, and witches. It also contained a series on "First Principles of Occult Philosophy" and an article "On Intolerance in Religion and Politics." The catalogue for the Harry Price Library indicates that the journal ran through May 1797, number 46. University of London, Harry Price Library; NYPL; Bodleian microfilm; Northwestern University; LOC.